Financial technology, often shortened to FinTech or fintech, is the new technology and innovation that aims to compete with traditional financial methods in the delivery of financial services. It is an emerging industry that uses technology to improve activities in finance. The use of smartphones for mobile banking, investing services and cryptocurrency are examples of technologies aiming to make financial services more accessible to the general public. Financial technology companies consist of both startups and established financial institutions and technology companies trying to replace or enhance the usage of financial services provided by existing financial companies. Many existing financial institutions are implementing Fintech solutions and technologies in order to improve and develop their services, as well as gaining an improved competitive stance. After reviewing more than 200 scientific papers citing the term "fintech," a scientific study on the definition of fintech concluded that "fintech is a new financial industry that applies technology to improve financial activities." FinTech is the new applications, processes, products, or business models in the financial services industry, composed of one or more complementary financial services and provided as an end-to-end process via the Internet. Financial technology has been used to automate insurance, trading, and risk management. The services may originate from various independent service providers including at least one licensed bank or insurer. The interconnection is enabled through open APIs and open banking and supported by regulations such as the European Payment Services Directive. In trading on capital markets, innovative electronic trading platforms facilitate trades online and in real time. Social trading networks allows investors to observe the trading behavior of their peers and expert traders and to follow their investment strategies on currency exchange and capital markets. 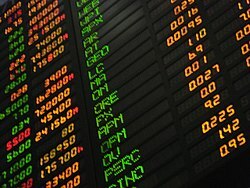 The platforms require little or no knowledge about financial markets, and have been described as disruptors which provide "a low-cost, sophisticated alternative to traditional wealth managers" by the World Economic Forum. Robo-advisers are a class of automated financial adviser that provide financial advice or investment management online with moderate to minimal human intervention. They provide digital financial advice based on mathematical rules or algorithms, and thus can provide a low-cost alternative to a human advisers. Global investment in financial technology increased more than 2,200% from $930 million in 2008 to more than $22 billion in 2015. The nascent financial technology industry in London has seen rapid growth over the last few years, according to the office of the Mayor of London. Forty percent of the City of London's workforce is employed in financial and technology services. In the Asia Pacific region, the growth will see a new financial technology hub to be opened in Sydney, in April 2015. According to KPMG, Sydney's financial services sector in 2017 creates 9 per cent of national GDP and is bigger than the financial services sector in either Hong Kong or Singapore. A financial technology innovation lab was launched in Hong Kong in 2015. In 2015, the Monetary Authority of Singapore launched an initiative named Fintech and Information Group to draw in start-ups from around the world. It pledged to spend $225 million in the fintech sector over the next five years. Financial magazine Forbes created a list of the leading disrupters in financial technology for its Forbes 2016 global Fintech 50. In Europe there is a list called the FinTech 50, which aims to recognise the most innovative companies in FinTech. A report published in February 2016 by EY commissioned by the UK Treasury compared seven leading FinTech hubs: the United Kingdom, California, New York City, Singapore, Germany, Australia and Hong Kong. It ranked California first for 'talent' and 'capital', the United Kingdom first for 'government policy' and New York City first for 'demand'. Finance is seen as one of the industries most vulnerable to disruption by software because financial services, much like publishing, are made of information rather than concrete goods. In particular blockchains have the potential to reduce the cost of transacting in a financial system. While finance has been shielded by regulation until now, and weathered the dot-com boom without major upheaval, a new wave of startups is increasingly "disaggregating" global banks. However, aggressive enforcement of the Bank Secrecy Act and money transmission regulations represents an ongoing threat to FinTech companies. 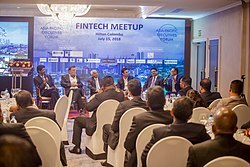 In response, the International Monetary Fund (IMF) and the World Bank jointly presented Bali Fintech Agenda on October 11, 2018 which consists of 12 policy elements acting as a guidelines for various governments and central banking institutions to adopt and deploy "rapid advances in financial technology". In addition to established competitors, FinTech companies often face doubts from financial regulators like issuing banks and the Federal Government. Data security is another issue regulators are concerned about because of the threat of hacking as well as the need to protect sensitive consumer and corporate financial data. Leading global Fintech companies are proactively turning to cloud technology to meet increasingly stringent compliance regulations. The Federal Trade Commission provides free resources for corporations of all sizes to meet their legal obligations of protecting sensitive data. Several private initiatives suggest that multiple layers of defense can help isolate and secure financial data. Any data breach, no matter how small, can result in direct liability to a company (see the Gramm–Leach–Bliley Act) and ruin a FinTech company's reputation. The online financial sector is also an increasing target of distributed denial of service extortion attacks. This security challenge is also faced by historical bank companies since they do offer Internet-connected customer services. ^ Schüffel, Patrick (2016). Taming the Beast: A Scientific Definition of Fintech. Journal of Innovation Management. p. 32-54. ^ a b Sanicola, Lenny (February 13, 2017). "What is FinTech?". Huffington Post. Retrieved August 20, 2017. ^ Schueffel, Patrick (March 9, 2017). "Taming the Beast: A Scientific Definition of Fintech". Journal of Innovation Management. 4 (4): 32–54. ISSN 2183-0606. ^ Scholten, Ulrich. "Banking-as-a-Service - what you need to know". VentureSkies. Retrieved January 16, 2017. ^ R. Jesse McWaters (June 2015). "How will the empowerment of individuals through automated systems and social networks transform the business of investment management?". The Future of Financial Services: How disruptive innovations are reshaping the way financial services are structured, provisioned and consumed (PDF) (Report). World Economic Forum. p. 125. Retrieved November 3, 2018. ^ "Global Fintech Investment Growth Continues in 2016" (PDF). Accenture. 2017. Retrieved January 15, 2018. ^ "What is FinTech and why does it matter to all entrepreneurs?". Hot Topics. July 2014. Retrieved December 9, 2014. ^ "Stockholm FinTech: An overview of the FinTech sector in the greater Stockholm Region". Stockholm Business Region. June 2015. Retrieved July 12, 2015. ^ "Fintech Investments Skyrocket in 2016– Report". redherring.com. Retrieved July 12, 2016. ^ "Brexit a boon for Lithuania's 'fintech' drive". The Business Times. Retrieved March 3, 2018. ^ Kauflin, Jeff. "The 11 Biggest Fintech Companies In America 2019". Forbes. Retrieved February 15, 2019. ^ "Sydney FinTech hub based on London's Level39 coming next April". BRW. November 2014. Retrieved November 26, 2014. ^ "Subscribe | theaustralian". www.theaustralian.com.au. Retrieved September 29, 2017. ^ "FinTech Innovation Lab in Hong Kong Launches With Eight Firms". Forbes. February 2015. Retrieved February 9, 2015. ^ "Fintech – the next frontier for Hong Kong's battle with Singapore?". Retrieved September 26, 2016. ^ Samantha Sharf (November 7, 2016). "The Fintech 50: The Complete List 2016". Forbes. Retrieved April 30, 2017. ^ "THE FINTECH50 2017". The FinTech 50. Retrieved June 27, 2018. ^ "About The FinTech50 I the 50 hottest FinTechs". The FinTech 50. Retrieved June 27, 2018. ^ "An evaluation of the international FinTech sector" (PDF). EY. February 24, 2016. Retrieved February 25, 2016. ^ Tasca, Paolo; Tomaso Aste; Loriana Pelizzon; Nicolas Perony (2016). Banking Beyond Banks and Money: A Guide to Banking Services in the Twenty-First Century. Springer. p. 215. ISBN 9783319424484. Retrieved November 16, 2016. ^ "How FutureAdvisor plans to shake up wealth management". Fortune. May 2014. ^ "Criminalizing Free Enterprise: The Bank Secrecy Act and the Cryptocurrency Revolution". Westlaw's Computer & Internet Journal. July 2, 2015. ^ "The Bali Fintech Agenda". IMF. Retrieved November 15, 2018. ^ Global, IndraStra. "Decoding the Bali Fintech Agenda". IndraStra. ISSN 2381-3652. ^ "Old Laws, New Models". Taylor Wessing. October 2014. ^ "Groundbreaking FinTech Innovations: Threat for banks, or opportunity of a lifetime?". Business Insider. January 3, 2018. ^ "Ensuring Cybersecurity In Fintech: Key Trends And Solutions". Forbes (magazine). March 2015. ^ "Protect Your Assets: Cybersecurity + FinTech". Wharton Fintech. March 2015. ^ "How FinTech Leaders Are Using The Cloud To Meet Compliance". Solgari.com. ^ "Data Security". Federal Trade Commission. ^ "Top 10 ways to secure your stored data". Computerworld. August 3, 2006. ^ "Data Security Considerations for FinTech Companies". Bloomberg. April 23, 2013. ^ "Financial Startups Reimagine Banking, but Security Still Paramount". Cloudbric. July 10, 2015. Retrieved September 15, 2015. ^ "Banks Lose Up to $100K/Hour to Shorter, More Intense DDoS Attacks". American Banker. April 23, 2015. ^ "How Hackers Make Money from DDoS Attacks". Fintech Ranking. April 23, 2015. ^ "Who lies behind the latest cyber attacks on JPMorgan Chase?". The Economist. August 28, 2014. Finastra is the third largest financial technology company in the world. The firm was formed in late 2017 through the combination of D+H and Misys, after Vista Equity Partners acquired Misys in June 2012 and subsequently purchased D+H in 2017. Ant Financial Services Group, formerly known as Alipay, is an affiliate company of the Chinese Alibaba Group. Ant Financial is the highest valued fintech company in the world, and the world's most valuable unicorn (start-up) company, with a valuation of US$150 billion. WeLab is a financial technology (fintech) company headquartered in Hong Kong. WeLab currently operates Wolaidai (我来贷), one of China’s leading mobile lending platforms, WeLend, Hong Kong’s leading online lending platform, and a fintech joint venture AWDA in Indonesia. David L. Shrier is an American futurist, author and entrepreneur. He has written for numerous publications including Forbes, CNBC, Newsweek, and The Asian Banker. Shrier also co-edits the MIT Connection Science imprint of MIT Press and is the author of various industry reference books in the fields of financial technology, digital identity, data governance and financial innovation. He is a globally recognized authority on financial innovation, serial entrepreneur, global educator, and government advisor. Shrier is the founder & CEO of Distilled Identity, an artificial intelligence company derived from MIT research and spun out of MIT Media Lab.